It's The Topeak MTX Trunkbag DXP Vs EXP: Who Will Win? There’s no point having a fantastic touring bike but not having an equally fantastic bag for the journey. A good bag should be made of enduring material and have the space to carry everything you want it to. I’ll be examining the Topeak mtx trunkbag DXP vs the EXP variety in an effort to find the best travel bag for your needs. If I’m touring then I need a bag like this, and the extra space, as well as the water bottle holder, make the DPS a very easy first pick. If you're in a hurry I'd personally choose the DXP. It's a much superior design and the extra space as well as the water bottle holder make the DPS a very easy first pick. Founded in 1991, Topeak has been another one of those brands connected with cycling at all levels. They have won multiple awards for numerous products, stretching from ratcheting tools to wrenches and baby seats. Their passion is to make your cycling commute to work, or touring as easy as it can be. They do that very well. Their bags are designed to be carried on a bike over long distances and then lifted via shoulder strap when necessary. This makes travelling much more convenient than using a bag which only does one of these things. The Topeak DPX bag comes with a little more oomph than its Topeak EXP counterpart. It has extra storage space than the EXP provides, and the DPX also comes with an additional water bottle holder, which the EXP is lacking. Both the DPX and the EXP are expandable and due to rigid molding panels will hold their shape even when not full. This reviewer starts off by explaining what he doesn't like. His personal taste is for softer sides, rather than the DPX's more rigid solution. This is personal preference but worth considering before buying. They also mention the top not being as expansive as previous models. Since the DPX has more space than the EXP I can only assume this is the reason for the top compartment not expanding as much. He then moves on to what he does like. First, it's 'rugged' which I take to mean will last a long time. Secondly, it has plenty of storage which is a big plus. Thirdly the side pockets are also spacious, which is good if you like that system. Finally, he also lets us know it will last for years, which is exactly what we want when spending good money. All in all, a very positive review and most others agree with him. 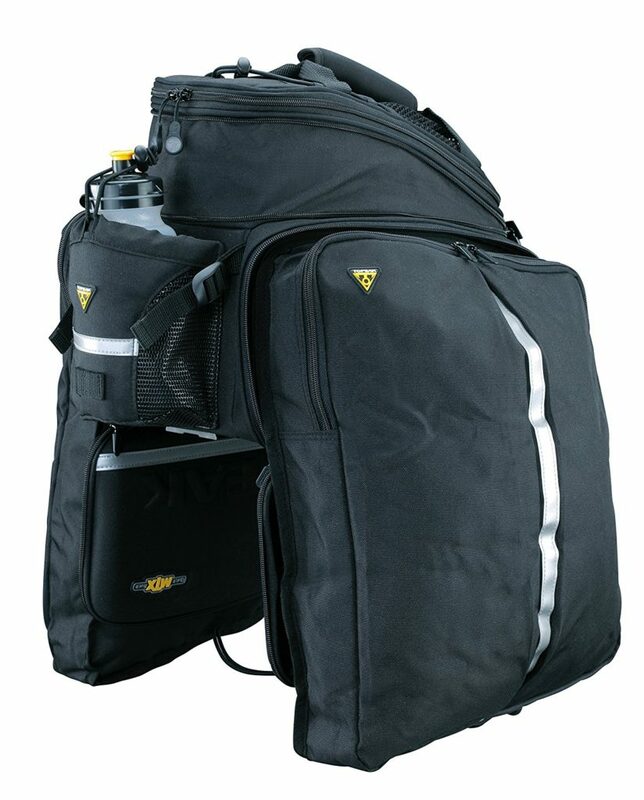 As mentioned above, Topeak has designed multiple touring bags in the past, and the EXP has been one of the most common, sturdy and enjoyable of their designs. The EXP was the first of these two bags to be produced by Topeak. It's created to fit on the back pannier rack, with side panels that are expandable, providing even more space. This is just the same as the DPX. It does have a little less space at 1,100 cubic inches of storage vs the 1,380 of the DPX. When you're buying an EXP you're buying the essentials and the durability, but you're saying no to the extra storage space in exchange for a lighter carry. It's all about preference. When full, a larger back like the DPX will make it slightly more difficult to turn, and a little more of a pain to make your way up those hills. Of course, you will be able to take an extra drink and maybe a pint of milk with you when you use that extra space. Proven track record of durability. Less space than the DPX. This reviewer leaves some interesting thoughts here. Firstly, he was definitely interested by the “quick track” setup that Topeak offers. This means there’s no need to tie the bag down with bungee cords. It does, however, require a bike rack designed like the Topeak MTX, to be certain to work. To clarify, Topeak create a rack called the Topeak MTX bike rack as well, this is available on Amazon. Therefore, if you use a different style bike rack it might be worth trying it out in a store before buying. He also loves the side drop panniers which allow him to carry groceries easily. This is where he notes he will sometimes kick the bag when it’s full and he is pedalling. 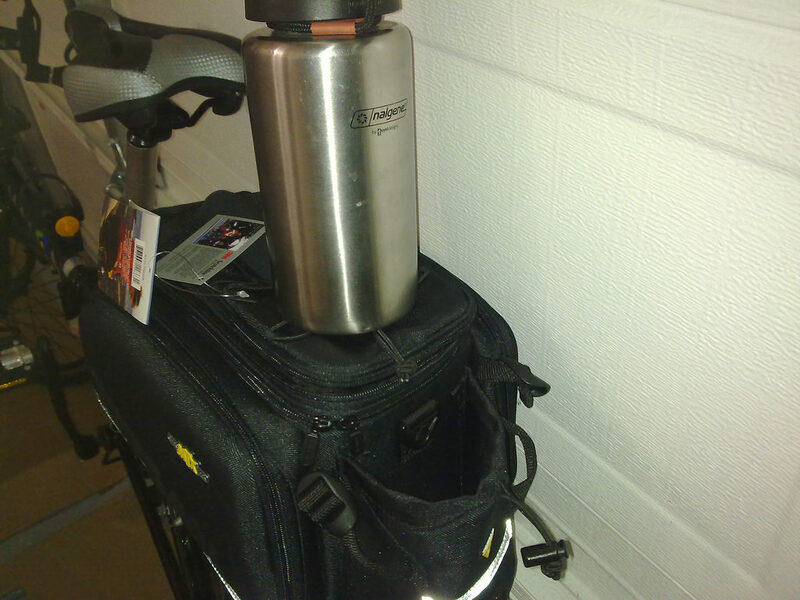 This is because the bag is designed for a touring or hybrid bike, not a regular road bike. These have longer frames which mean you don't kick the bag as the pedal goes around. Let me begin by saying you don’t need either of these bags if you’re not using a touring or hybrid bike. They come with drop down panniers which will not work properly when cycling on a bike with a shorter frame. You will constantly hit the panniers as you pedal. On the other hand, if you do have a normal bike with a longer frame then definitely use them. You will love the flexibility they bring and the ability to run errands like grocery shopping without having to catch the bus or drive a car. Many people want to know why the bag comes with bungees if it's designed to use a quick track system. Well, the quick track system does help you slide the bag on and off really easily without having to use velcro or tie it to the back rack. That's not what the bungees are for. Your bag will be full of gear, and that's a lot of weight. Making tight corners at fast speeds will mean that weight shifts, the bungees are there for those journeys that you have a full bag and you don't want to weight shifting. Loop them around, keep them tight and stop the weight derailing your smooth turns. This is a really simple concept, although as some reviews have shown, not everyone prefers rigid panels. Basically, the walls of the bag and the compartments are kept rigid to stop it flopping to one side or another. There's nothing worse than carrying a bag that either flops down and risks being caught in the wheels, or even worse changes the centre of gravity on the bike when you're turning. The rigid molded walls prevent all of this but can make for a less expandable structure. I've linked to an example of a quick track rack. It is produced to go with specially designed bags such as the DPX and XPS. They use a quick attach mechanism that keeps the bags in place without having to use bungee cords and rope. The bag attaches to the runners and slides right in. It's a genius idea, well worth the investment although you may have to install a new rack if the one that comes with your bike doesn't have this ability. This Gearonic branded bag is much better for none touring bikes. It's still designed to fit on a back bike rack, and it still has panniers, but it's much smaller and much cheaper. While the panniers will still be a pain, your average cyclist is not going to feel as much weight difference. You will also not need as much space as when using the Topeak designs. Alternatively, a touring cyclist can use this for simple errands and chores around town or when going on a much shorter ride that won't require the extra space of a Topeak DPX or EXP. The added bonus is the price, which is much much cheaper than either of the Topeak products. This ArcEnCiel design has a lot going for it. 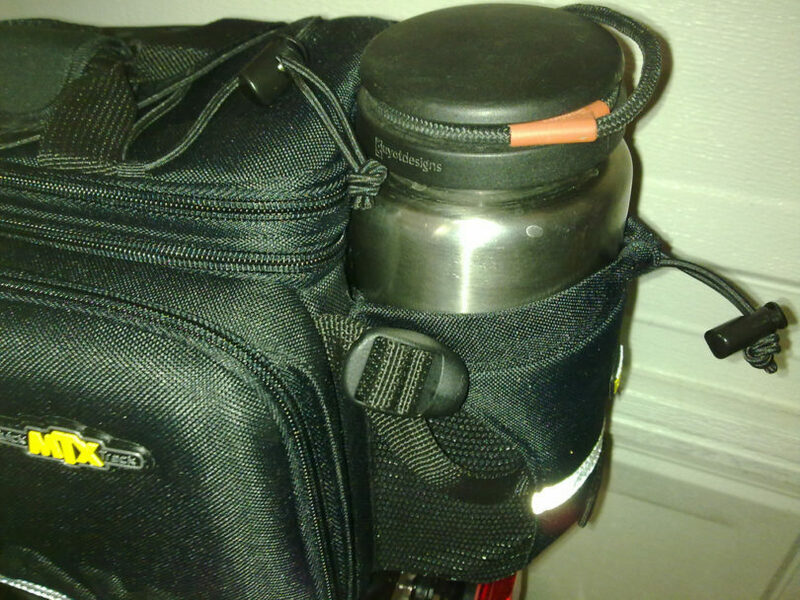 I love the combination design, of a top bag that can detach from the two panniers. 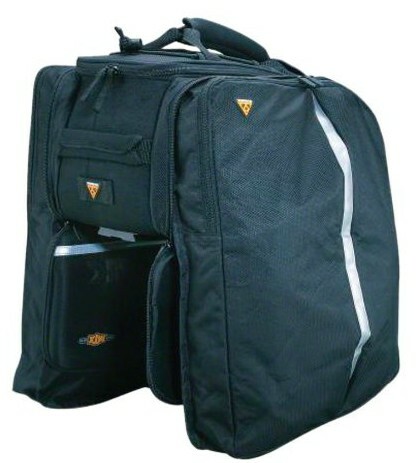 This bag can be used in many more situations than large, bulky travel bags will allow, since the larger section can be easily detached for shorter journeys. It's still water resistant, and the writing on the side is reflective, making it ideal for night use. While the DPX also has reflective strips, an EXP does not. The panniers also slope backwards, away from the legs, which mean it may be rideable with shorter frame bikes such as a mountain or road b﻿ike. Definitely worth checking out if you want something more flexible. In my opinion the DPS is the much superior design. While it originally cost much more than the EXP, I’ve noticed that Amazon quite frequently prices both products in the same range.